With the creation of the Magical Unicorn typeface a few years ago, the unicorn typeface predecessed the unicorn emoji by some time. With this typeface, it was possible to merge text (about unicorns!) and typeface into one. For the type family, the range of characters was converted into a fitting shape: Numerals appeared as rainbows and punctuation sparkled as stars. Each glyph had two variations to prevent repetition and next to this the family included a ‘sans’ weight, without the horn. But this start was simplistic. The level of detail was low and shapes crude, not fitting the unicorn. Next to this the unicorn illustrations were often incomplete, making them appear as floating heads surrounded by lush manes. It needed to become more special to do true justice to these magnificent beasts. Next to higher detail, what more could be added? At least the whole unicorn had to be shown in the improved illustrations, from the tip of the horn to the far end of the tail. But it could be more impressive, and what creatures are more special than winged unicorns, also known as pegacorns? Unicorns blessed with flight through Pegasus wings make a good combination, with plenty of history, myth and pop culture to draw inspiration from. New initials were drawn on large sheets and shaded. 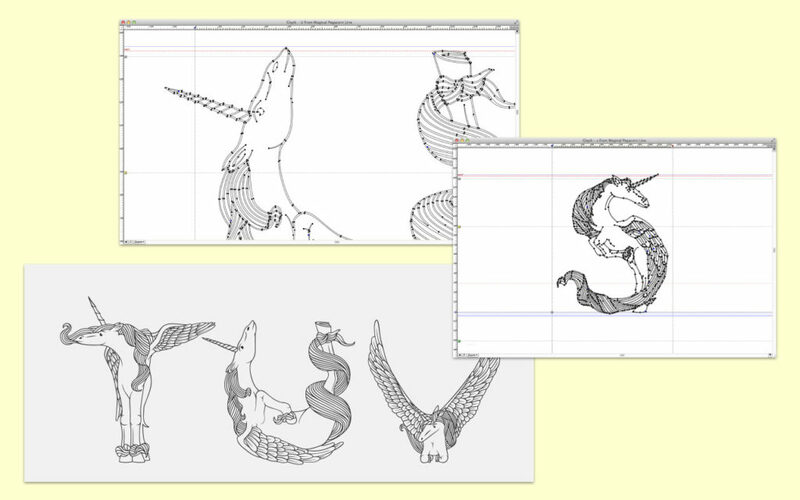 Different perspectives, hooves, manes and wings were used to create fitting letterforms, while keeping the illusion of a complete pegacorn intact. The drawings were scanned, cleaned and compiled into a specimen folder, showcasing the alphabet with in-use examples. Making a direct copy of the drawings for digitisation would not be possible due to the limits of font technology, but a precise trace would be more than good enough. Removing the shading would also make the glyphs usable in slightly smaller sizes. Each scan was carefully hand-traced and converted to a font glyph, adding and removing detail for the best result. After the conversion, each letter was finetuned further for optimal technical and visual performance. After this, more characters were added to create a complete glyph set. Punctuation, numerals and diacritics were added to make the initials usable for most European languages. 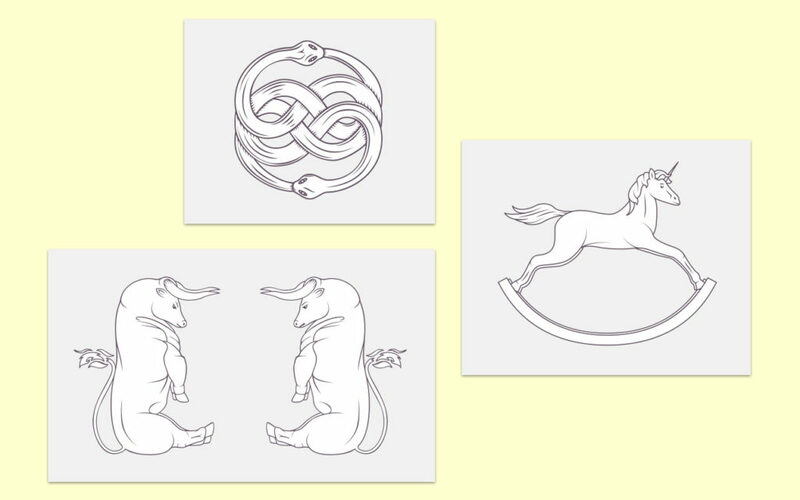 Each extra glyph element was inspired by the legend surrounding unicorn and Pegasus, tying script and shape together. Influences for extra glyphs ranged from art to popular culture, from classic literature to blockbuster movies. Dingbats were also added, such as unicorn rocking horses, hobby horses and castle elements which can be used to type your own castle (which is based on the castle featured in the the hunt of the unicorn tapestries). 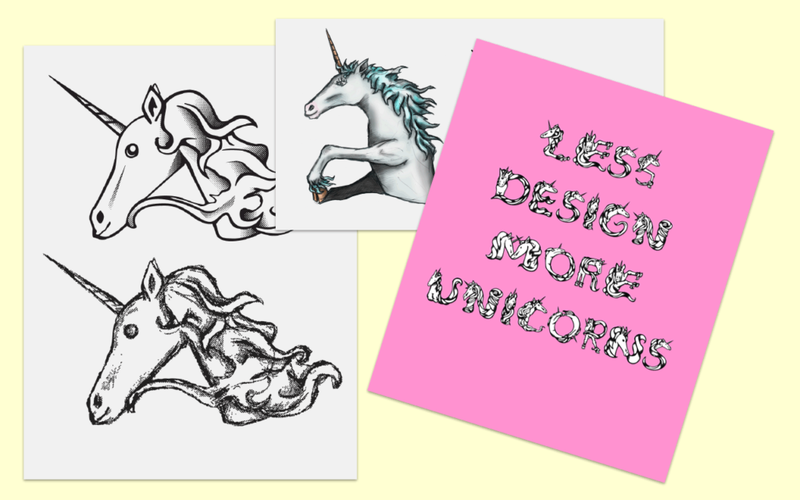 Consisting of the full Latin alphabet, and counting over 100 extra characters, dingbats and numerals, the Pegacorn Initials are the most complete and usable pegasus-illustration source to date!